Minecraft has a visual rather simple square with its graphics, but there is a lot of complexity hidden it in the format of Redstone items. This curious red stone dust is able to create very useful mechanical objects and link them by extremely complex circuits if necessary. Check out how to create the Redstone items in PS4, Xbox One, PS3, Xbox 360, PS Vita and PC. Step 1. The first step is obviously to get Redstone, which can be identified as a stone with some bright red nuggets in it and that is in some deep levels underground. Step 2. To download Redstone a block you need to use a Pick Iron or higher. If you break a Redstone block with a stone pick, will receive nothing in return. 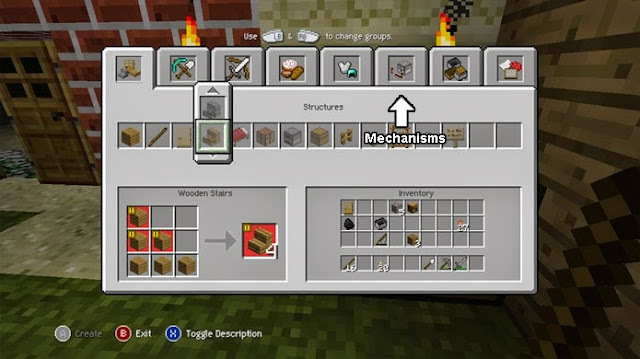 Step 3: Press Square (PlayStation) or X (Xbox) to open your crafting area to create simple items or visit a desk with the left trigger to more complex items. Step 4: Press the shoulder buttons L1 and R1 (PlayStation) or LB and RB (Xbox) until you reach the tab with the icon of a lever, written Mechanisms. Step 5: There you will find a number of items that can be built with Redstone, just have all the ingredients needed to create them as torches Redstone Repeaters, comparators and more. Step 6: Press E to open your crafting area to create simple items or visit a desk with right mouse button for more complex items. 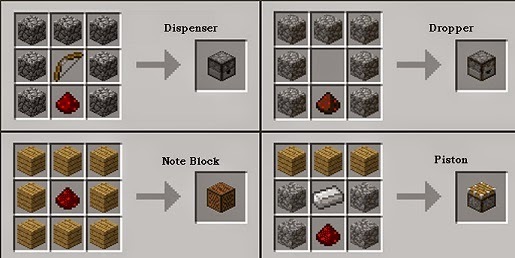 Step 7: Place the necessary ingredients according to the item Redstone to create. For example, to create Redstone Torches, Redstone put powder anywhere on the table and twig below.